Greenhouse doors don’t seem like they could be too complicated, but since we’re always looking for ways to improve our quality greenhouses, we’ve discovered a better way to build doorways. 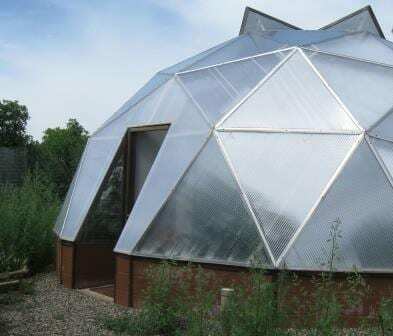 We are the first geodesic dome kit manufacturer to develop and offer the snowshed entryway. In the past all of our Growing Dome greenhouse kits had an inset entry (see photo below). This inset style of doorway worked very well for decades, but there always was the drawback of snow falling off the top of the Growing Dome and piling up in big drifts in front of the door. 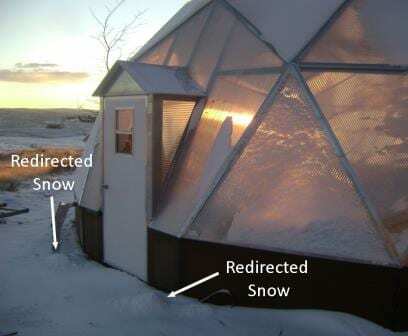 With the improved snowshed entryway, the snow that slides off the top of the Growing Dome is redirected out and away from the front of the greenhouse door eliminating this problem. As we developed the snowshed we realized that besides solving the problem of having extra snow to shovel, the snowshed has a distinct additional advantage. It takes less time, materials, and effort to install! For the old inset greenhouse door we recommended pouring a concrete slab in front of the door to mitigate frost heaving. With this upgraded snowshed doorway there is less worry about frost heaving, so no concrete slab is necessary. This cuts down on the installation time and materials needed for the build. The undersoil heating & cooling system is also easier to bury as it passes under the snowshed doorway, which too cuts down on installation time and effort. After developing and installing this doorway on dozens of our four season greenhouses, we’ve decided to include this new feature in all of our greenhouse kits. 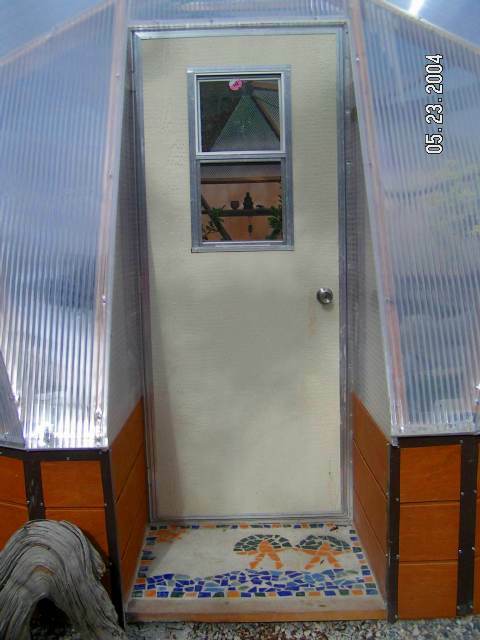 NOTE: Sizes 18’, 26’, 33’ and 42’ diameter all have a wheelchair accessible door (36” x 80”). Sizes 15’ and 22’ do not have wheelchair accessible doors and the doorway will need to be modified to accommodate a larger door. Contact us at 800-753-9333 to learn more. The greenhouse door that comes with your Growing Dome kit has a small sliding window with a screen. The polycarbonate glazing panels covering the greenhouse are clear, but they distort images, so the window in the door allows you to see out clearly through the entrance. 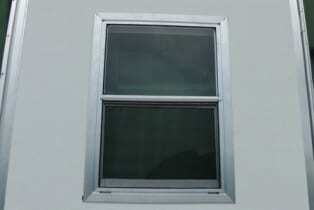 The window, when open, allows for some additional ventilation. If you live in a hot climate and would like even more ventilation, we recommend purchasing a screen door at a local building supply store and installing that in addition to the door with window that comes standard with the Growing Dome green house kit. The upgrade for an extra greenhouse door is only available for the 33 ft Growing Dome. The 42 ft Growing Dome greenhouse kit already comes with two doors. In a community and/or school space where the flow of human traffic needs to be optimized, an extra door really helps move classes and groups through the space efficiently. Some building departments actually require this additional door before granting a permit. Be sure to check with your local building department to find out what they require. The extra door is also extremely helpful with cross ventilation in warm climates.